Prime Minister Edouard Philippe told reporters they hoped for "a new spire that is adapted to the techniques and the challenges of our era". The spire was completely destroyed in the blaze that tore through the 850-year-old Gothic building&apos;s roof. However, much of the Parisian building - including its famed towers - survived, and thoughts have now turned to how to reconstruct what has been lost. President Emmanuel Macron vowed it will be rebuilt "even more beautifully", adding that he wants the work done within five years - although experts warn its reconstruction could take decades. But Mr Philippe questioned "whether we should even recreate the spire as it was conceived by Viollet-le-Duc... or if, as is often the case in the evolution of heritage, we should endow Notre-Dame with a new spire". A combined �800m ($902m; �692m) has already been pledged by a number of companies and business tycoons to help rebuild the Unesco World Heritage site. 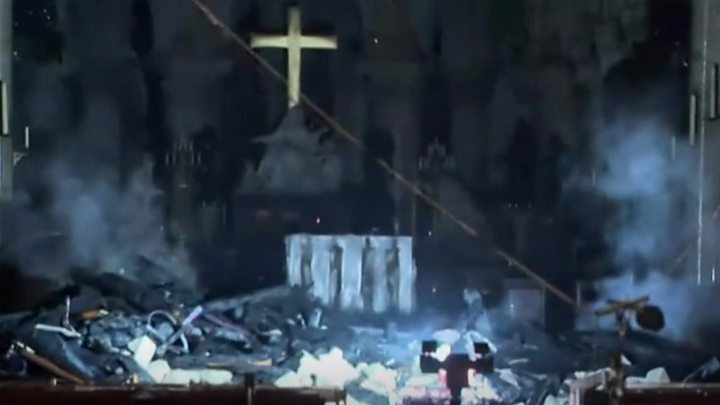 Mr Philippe promised "every euro paid for the construction of Notre-Dame will serve this purpose and nothing else", while also announcing a tax reduction for those donating towards the reconstruction. 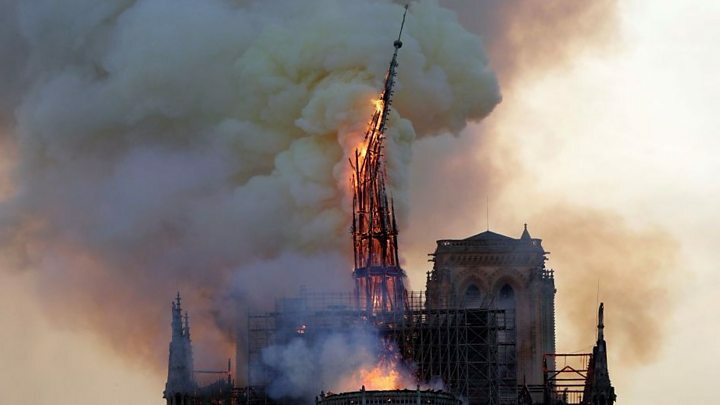 The blaze - which was discovered at 18:43 (16:43 GMT) on Monday and was not fully extinguished until almost 15 hours later - destroyed most of the cathedral&apos;s roof and led to the collapse of its iconic spire. Deputy Interior Minister Laurent Nu�ez said the structure was in good condition "overall" but that "some vulnerabilities" had been identified in the stone vaults and the remainder of the ceiling. In his speech Mr Macron heaped praise on the fire services, saying they took "extreme risks" to tackle the blaze. "Nothing indicates this was a deliberate act," said public prosecutor R�my Heitz, adding that he expected to be a "long and complex" case. Work to remove the cathedral&apos;s paintings will begin on Friday, Mr Riester said. Published on Wed, 17 Apr 2019 12:21:54 GMT, © All rights reserved by the publisher.